The trend in Alaska guided fishing seems to be the mega resort - the 50 guest lodge. We do not follow that trend, although we offer many of the amenities the larger resorts offer. We believe that we give a higher quality fishing experience by staying small and offering personalized service. The lodge will hold up to eight guests, many times making you the only ones in the lodge. Our food, lodging and fishing gear is first-cabin and all provided. We use G. Loomis rods exclusively. We will pack and freeze your daily catch for transportation home. We will delight you with lots of fresh seafood and gourmet Alaskan meals prepared by Jan, our kitchen wizard. We are holders of a US National Forest Service permit to fish the fresh waters of the Tongass National Forest. July, August, and September is our salmon and halibut season. At this time, a variety of outstanding fishing opportunities exist. 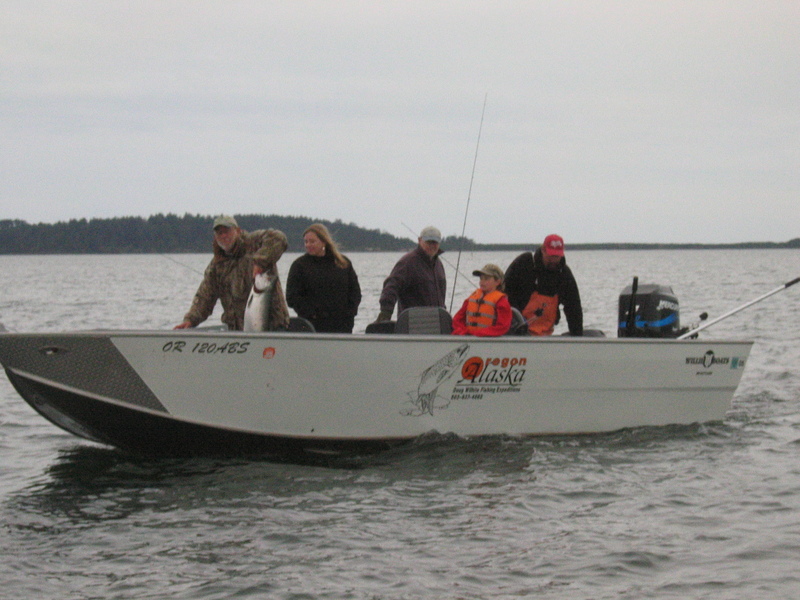 Coho salmon are abundant in the salt and fresh water. 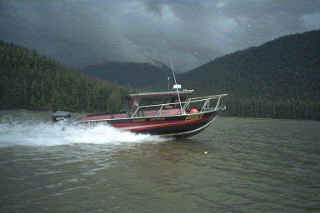 We have three boats, an 18 ft and a 20 ft jet boat for rivers & bay, and a 26 ft cabin cruiser for ocean fishing. We use jet boats to access Rivers and estuaries to fly or spinner fish for these chromers. King salmon are available in the salt water, these fish can weigh anywhere from 15 to 50 lb., 30 pounders are very common. Our halibut fishing is superb! The halibut weight is 30 lb. to over 300 lbs. A 100-150 lb. halibut is an average catch for our area. For the fly fisherman our spring Steelhead season is hard to beat. I strictly fly fish and practice catch and release for all our native Steelhead. This is a great time for the beginning fly fisherman because they will have lots of success, usually the first day. The Steelhead season starts the first part of April and runs to the end of May. The weather is usually very nice this time of year. April and May also offers great dry fly fishing for cutthroat and rainbow trout, as well as Dolly Varden. Some of the sea run trout will get up to 6lbs. To access the many streams and lakes I use the 18 ft jet sled or the existing logging roads. Humpback salmon literally clog some streams, to catch them on light fly rods is very exciting especially when the fish are fresh from the ocean. Rainbow, Cutthroat Trout and Dolly Varden are in most streams and lakes, making it exceptionally fun using dry flies or ultra light spinners. The cost for a completely catered five day fishing six nights lodging is $2995.00 per person. All meals, lodging, fishing excursions, and fishing gear is provided. Airfare is NOT included in package price. If you desire a custom trip of less than a week, this can also be arranged. A 50% deposit is required and due within 10 days of booking your dates by phone. Our lodge is located in Coffman Cove on Prince of Wales Island, Southeast Alaska. Access is by floatplane from Ketchikan. Copyright © 2006 Nestucca River Outfitter, The Original Nestucca Valley Sporting Goods. All rights reserved.